Portsmouth Guildhall located in the city centre is the home of Portsmouth City Council. The Guildhall houses a large auditorium, which is used for many shows and conferences. 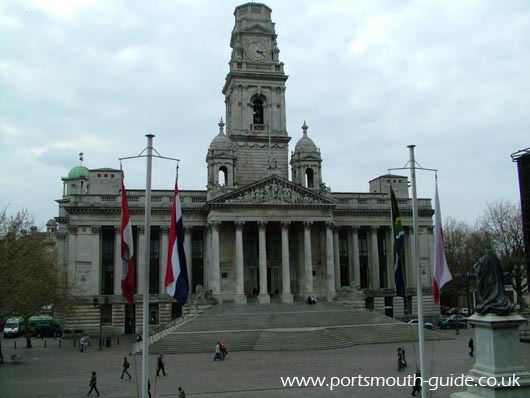 The town hall was opened in 1890 and then on 21st April 1926 it was announced that Portsmouth was raised to the status of a city and the town hall was renamed The Guildhall. Then in 1928 the King gave the title of Lord Mayor to the Chief Magistrate of the new city. On 10th January 1941, there was a major enemy air attack on Portsmouth and the Guildhall was hit by incendiary bombs and flames soon spread throughout the length and breadth of the building. In early 1945 the Guildhall was a shell due to it having been bombed during the second world war and it was not until 8 June 1959 that the Guildhall was reopened by Her Majesty the Queen. The Guildhall consists of a foyer, small conference hall, main concert hall, lower banqueting hall, first floor reception areas, the star chamber, crystal constellations, council chambers and parlours for the mayor and mayoress. The main concert hall has a capacity of 2,228 people and is 29m by 25.3m. The ceiling is 13.4m above the floor and the roof is another 3.8m above that. The organ was purchased at a cost of over £17,000. The lower banqueting hall will hold 200 people for meetings or 150 for banquets. The Star Chamber has the theme "Heaven's Light Our Guide". The huge mural which covers the north wall depicts many historical scenes of Portsmouth’s past and is made of glass and mirrors. In the Crystal Constellations the 12 signs of the Zodiac can be seen. The Council Chambers are used for council meetings and can seat a maximum of 100 but normally has 64 council members. In the chambers there is a Mayoral Record Panel which depicts all the mayors dating back nearly 800 years, the dates they were mayor from and any memorable events that happened. The pictures round the edge are taken from the memorable events that have happened. The Lord Mayor and Lady Mayoress have Parlours in the Guildhall with the tower room being 32 feet square and yet 56ft high. There is an inserted floor between the second and third floor where the full height was not needed and is known as upper second. The Guildhall Clock was installed in 1950 at a cost of £4,000. There is a large amount of civic treasures housed in the Guildhall. On the above picture the Guildhall Portico can be seen with Britannia in the centre. To the left and right of Britannia are Europe, Asia, Africa and America. There are tours around the Guildhall in the summer and there has been a guide to the Guildhall published called "The City of Portsmouth Guildhall" ISBN 0 901559 80 6. 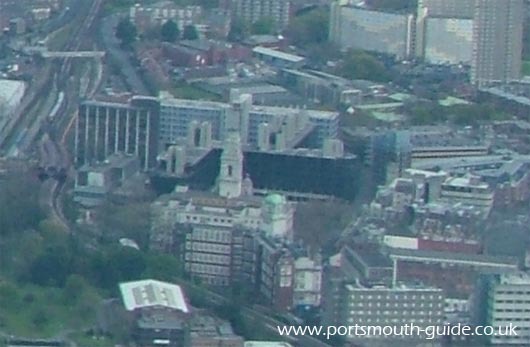 The above picture shows Portsmouth Guildhall from the air with the Guildhall in the centre of the picture. Just behind the Guildhall is a Portsmouth University building and just in front of the Guildhall are the civic offices.